Twee lezingen, van Michael Della Rocca en Hasana Sharp, volgen nog in maart. Het is aardig om kennis te nemen van de korte samenvattingen van die inleidingen. In die van Yitzhak Y. Melamed over "Spinoza’s ‘Atheism'" kan ik mij geheel vinden (komt overeen met blogs die ik schreef in verzet tegen Spinoza als atheïst zien). The charge of atheism was brought against Spinoza by both his Christian contemporaries, and many of his eighteenth century readers (such as, F.H. Jacobi). In our times, Spinoza became a cult figure in certain circles due to his alleged atheism. In my paper, I will argue that Spinoza deserves neither the praises nor the condemnations bestowed upon him, and that the view of Spinoza as an atheist relies on a narrow minded conception of the divine in anthropomorphic terms. 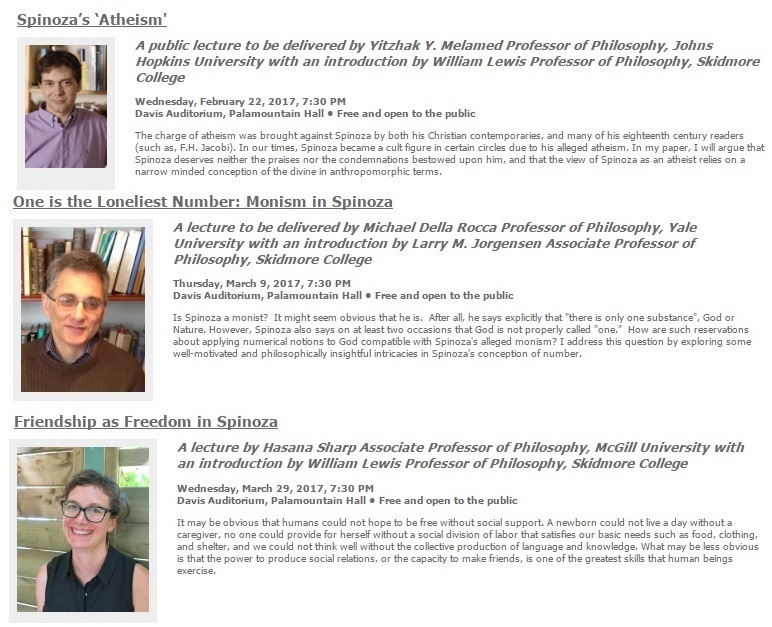 Relying on an analysis of both the TTP and the Ethics, I will argue that the chief claims of both works are unintelligible under the assumption of Spinoza’s atheism. I will further argue that the textbook version of the so-called “orthodox conception of God” (whose existence Spinoza denied) is an instance of conceptual colonialism, i.e., the uncritical application of the categories of a hegemonic culture (in this case, Western Christianity) on marginal cultures (here: Rabbinic thought).